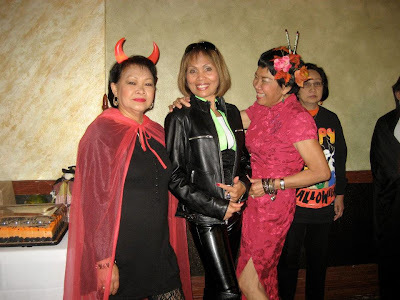 Got this nice picture of my mother in - law on their Halloween party and while she sported the cute red Chinese Lady, her friends are quite cool in their devilish attire. The kids at home had their own fair play of their favorite costume. My kid had to be the death angel with his black cape and scary mask. Now, that the day of the dead is fast coming, costume parties can be expected.